A beautifully executed high level restoration of this TR6C. A comprehensive nut and bolt restoration to factory standards. Nothing has been overlooked, with no expense spared. This is a handsome addition to any collection, or a good way to start your collection. 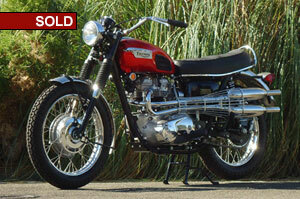 This TR6C is a Jim Hiddleston meticulous restoration that is sold with a Bill of Sale. The Triumph Trophy was introduced in 1956 well-suited to off-road use. During this time frame in motorcycle history, bikes did not tend to be highly specialized the way they are today. However, the Trophy tended towards such specialization in utility and a wide range of uses relative to the street-sport Bonneville. By 1967 the Triumph Trophy TR6 had evolved from a ‘street scrambler’ into a street bike, not the multi-purpose original Trophy. At the heart of the Triumph Trophy was a 649cc inline twin-cylinder four-stroke engine. The engine was air-cooled and had an overhead cam, breathing through a single 30mm Amal Carburetor. The lower head-flow, relative to the 1967 Bonneville produced slightly less than the ‘Bonnie’s’ 46 horsepower but more than previous Trophy’s 42 horsepower. Power was delivered from a chain and four-speed transmission. For chassis and brakes the Trophy TR6 engaged a steel cradle frame with a steel swing arm and double rear shocks, which was typical of the period. The front suspension was based on telescopic fork cartridges using distinct rubber fork-guards for protection. Stopping power came from both front and rear drum brakes. In 1967 the street performing Trophy received performance credits by increased compression from 8.5:1 to 9:1 which was higher than the Bonneville’s. It also adopted the Bonneville’s valve train, using the same cam profile. The Triumph Trophy had several famous moments throughout its history. The Trophy’s motorcycle abilities were highlighted in The Great Escape starring Steve McQueen who demonstrated all of the Triumph’s unique characteristics. On the small screen, the Trophy was among several motorcycles ridden by Happy Days’ Arthur Fonzarelli, or ‘The Fonz.’ While the Fonz had been seen on Harley’s and BSA’s, it is said he actually preferred Triumph’s, the Trophy among them.